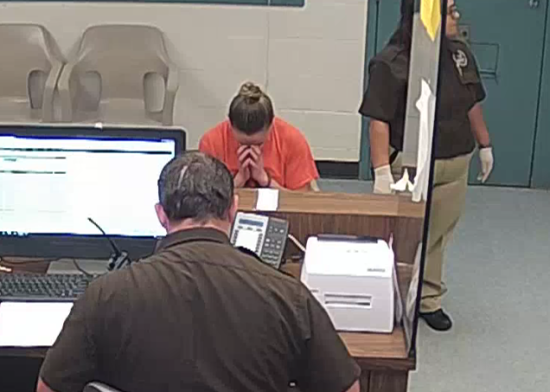 KAUFMAN, Texas – The Kaufman County Jail released video Thursday of Dallas Police Officer Amber Guyger getting booked on a manslaughter charge after turning herself in on Sunday, September 9. CBS Dallas/Fort Worth reports the booking happened three days after she fatally shot Botham Jean in his own apartment. According to court documents, Guyger, 30, mistook his apartment for her own and thought she encountered a burglar. Guyger is out of jail on a $300,000 bond, but Dallas County District Attorney Faith Johnson is taking the case to a grand jury. At one point in the video, Guyger leans down and puts her face in her hands before recomposing herself. An attorney for Jean's family said a police affidavit shows investigators immediately sought evidence to discredit the victim. "They immediately began looking to smear him," said Lee Merritt. A Dallas police affidavit says officers recovered two bullet casings, a police backpack and vest and 10.4 grams of marijuana from the apartment of a man killed by an officer who said she mistook his apartment for her own. A search warrant affidavit says a lunch box, laptop computer, metal marijuana grinder, two electronic keys and two used packages of medical aid also were recovered from Jean's Dallas apartment. Guyger says the door was "ajar" and inside noticed "the apartment interior was nearly completely dark." "To hear that his door was open, he would never -- and have the lights off -- he would never do that," Allisa, Botham's sister, told CBS News' Omar Villafranca. "He was like me. He does not like the dark." Earlier Thursday, friends and family gathered for Jean's funeral. Hundreds of people filed in to the service honoring the 26-year-old's life and legacy. Scattered among the group of well-wishers was Dallas Mayor Mike Rawlings, Dallas County Judge Clay Jenkins, Bishop T.D. Jakes and Dallas Police Chief U. Renee Hall.